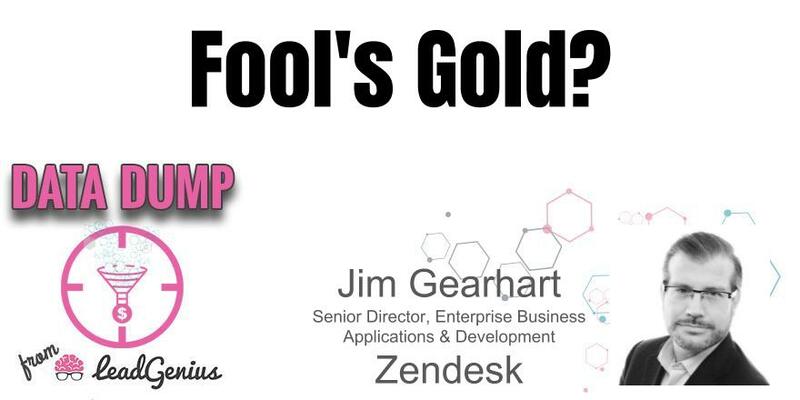 Mark Godley puts Jim Gearhart, Senior Director, Enterprise Business Applications & Development at Zendesk, in the hot seat to discuss how many component technologies are needed for sales and marketing. How SaaS has reduced the cost and increased the capabilities of marketing and sales departments. Jim will also share his experience as a buyer, handling endless pitches from a dizzying array of vendors claiming nirvana just a PO away. Join September’s Data Dump podcast to get the inside scoop on the future of data and Martech tools. With two decades of experience building and leading technology teams, Gearhart has worked in a technical and strategic leadership capacity for a number of notable tech companies including HP, Agilent Technologies, Unify, Turn, Omniture, & Adobe. Currently serving as Sr. Director of Enterprise Business Applications & Development for Zendesk, Gearhart provides executive leadership and vision to to ensure Zendesk’s objectives are realized through a modern, cloud-first technology stack. Gearhart is at the intersection of pricing & packaging decisions for Zendesk’s SaaS products, enterprise platform & process governance, and represents Zendesk in MGI's Monetization Leadership Council, a Silicon Valley group dedicated to identifying and sharing market trends and best practices for SaaS companies. DataDump Radio is hosted by Mark Godley, CEO of LeadGenius which is the sponsor for this Radio/Podcast.